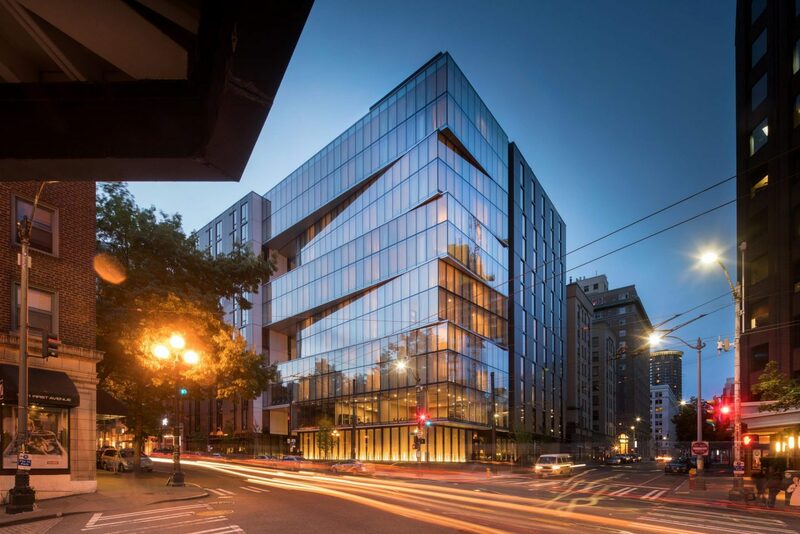 On November 13, Olson Kundig’s 100 Stewart Hotel and Apartments was awarded a 2017 Award of Merit from the Seattle chapter of the American Institute of Architects (AIA). The AIA Seattle Honor Awards recognize design excellence in the Washington region, acknowledging the diverse perspectives, scales and typologies that encompass the practice of architecture in Washington State. Located where the downtown Seattle grid hinges, 100 Stewart Hotel and Apartments celebrates its unique edge condition between the historic Pike Place Market District and Seattle’s rapidly developing downtown financial district. The building’s form responds to this edge condition with a focal point “glass lantern” with geometric shifts reflecting the street grid alignment. An interior courtyard connects to the neighborhood’s existing pedestrian pathways, offering a sheltered space of respite for passersby. Design Principal Tom Kundig, FAIA and Principal Kirsten R. Murray, FAIA are delighted to share the honor of this award with the project’s valued partners and client. Engineer – Mechanical: Holaday-Parks, Inc. Engineer – Plumbing: Hawk Mechanical Contractors, Inc.